Maia and I both have the great luck of living in a place where good local food is easily available. California is a standout in produce production, and you can’t go 5 miles on a Saturday in San Diego county without stumbling upon a farmer’s market. Stalls there are lined with ‘seasonal’ veggies (quotation marks because of SoCal’s eerie refusal to have seasons). 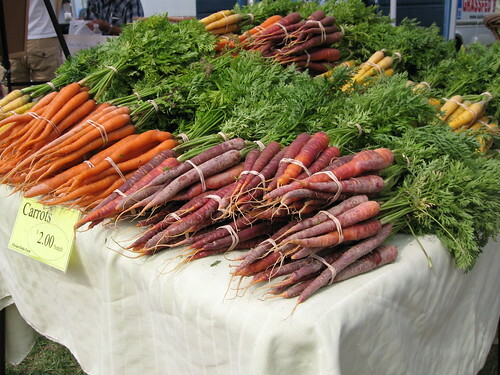 From squash blossoms to cherries to pluots to sweet peas, San Diego’s markets overflow with produce you just can’t find locally in here in North Carolina. Don’t get me wrong. We do have our fair share of exceptional and varied produce. The realm that RTP (that’s Research Triangle Park, corners of which are Raleigh, Durham, and Chapel Hill) rules, however, is meat. The Carrboro Farmer’s Market has everything you’d ever want. Local grass fed beef? 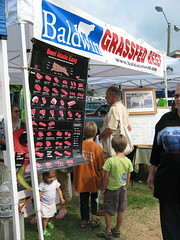 Baldwin Beef has you covered. Heritage pork and the best damn breakfast sausage ever? Cane Creek‘s just around the corner. Really, truly free range chicken and eggs? A mere hobby for most farmers, available at every other stand. Fresh cheese made locally from local cow and goat milk? Take your pick. I hadn’t really appreciated how unique this availability of local meat and dairy was until I started reading Jay’s blog at The Linkery. Admirably, all of The Linkery’s meat is sourced from independent farmers, making it one of the very few restaurants disconnected from the commodity meat market. Unfortunately, he still has to import most of it from other states. 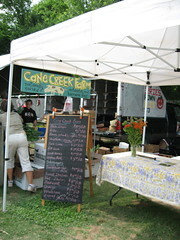 For example, a lot of his pork is from Cane Creek’s heritage Ossabaw hogs. Many restaurants around here get all of their pork, dairy, chicken, and eggs locally.. which I love. It’s a truly special place to live. All of this is fantastic, but the part I really love is that I can get farm fresh eggs easily. 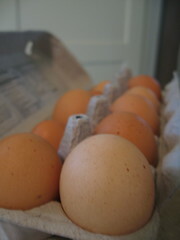 If you think all eggs are the same, I can’t wait until you try a fresh egg. 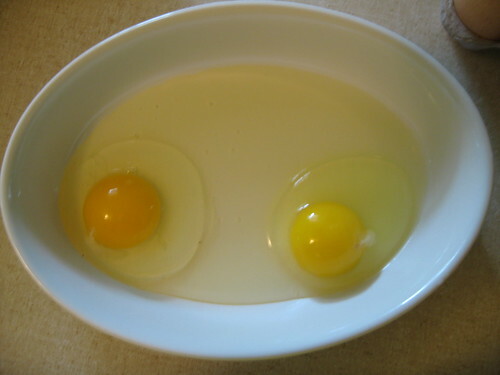 Cracked into a pan the whites have some body, so the eggs sit up straight. This makes cooking over-easy a breeze (you can’t overcook the yolk if it’s not touching the pan). The difference in color, texture, and taste between farm fresh eggs and “free range” mass produced grocery store eggs (like Horizon’s) is unbelievable. My new dream house has not only a large garden plot and a few fruit trees, but a chicken coup with 3 or 4 laying hens. I can’t wait. This entry was written by theotheraverett and posted on June 23, 2007 at 7:01 am and filed under Eating Out, NC Triangle. Bookmark the permalink. Follow any comments here with the RSS feed for this post. Post a comment or leave a trackback: Trackback URL. I LOVE pork. Now you have me craving breakfast sausage. Great photos! Lotus – sure, I could always use some more manual labor. Alice – if you ever need a chicken-sitter, I’m your girl. Jay – Yeah, Lantern is fantastic, though I haven’t made it there in entirely too long.